After Mooney Falls, we walked downriver a little and turned left up Ghost Canyon. Before those of European descent started settling in Arizona, the Havasu would conduct their rituals here after a person had died, which is where it gets its name Ghost Canyon from. During the most aggressive invasion of tribal lands by US Government agencies this was part of a tourist camp ground. Its desecration by visitors was one of the many matters cited by the Havasu in their long fight to regain the land in and around the Grand Canyon they had once occupied. In 1975 they were finally successful and now have control over access and its use. There is a cemetery in Supai now and visitors are allowed to visit Ghost Canyon during the day. The Canyon is a wash, flooding mainly during the monsoon season but had some water running down part of it while we were hiking up it. Partway on our hike, it did start to rain, fortunately the rock formations provided us with shelter. Near the top, large boulders form a blockade across the canyon, we needed to squeeze through the gap one at a time. The squeeze was worth it, because we go to see this amazing ‘pipe’ carved in the limestone by vast amounts water rushing down during downpours. 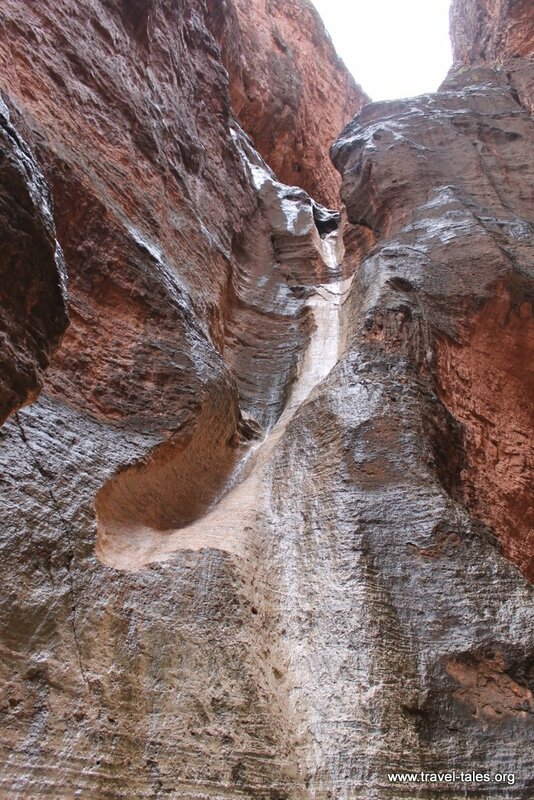 and the views looking back down Ghost Canyon towards Havasu Creek.